Hey guys, Josh here, back again with another episode of the Cal-Mil classroom. So this week we're talking about our Enamelware collection. So, Enamelware in its original form was introduced back in the 1870s, so very long time ago. This year we're introducing a new version of Enamelware, just in a slightly different form. Ours is melamine. Melamine is very durable, very strong, and it's dishwasher safe which makes it very, very convenient. So as you can see we have a nice blue rim on our Enamelware, traditionally Enamelware had either a blue rim or a red rim on it, and it was actually one of the first multicolored or technicolor-ed patterns in kitchenware. So as you can see we have smaller pieces like this which is meant for a french fry holder or presentation, we also have larger trays. Something like this, deeper trays like this, all of that nice bright blue contrast. So as you can see we have multiple different styles in our Enamelware collection. It's a very popular collection for us, its brand new in 2016. So i'll be sure to link all the products below in the description so you guys can get to our website and check out these different pieces. Thanks for watching, this has been another episode of the Cal-Mil classroom, we'll see you next time. The Enamelware Melamine collection from Cal-Mil comes in a beautiful, blue-rimmed design that's sturdy, durable, and dishwasher safe! Check out this video for more information. Cal-Mil 3343-10-15 White Enamelware 3.75 Qt. Melamine Bowl - 10 3/4" x 5"
Cal-Mil 3343-8-15 White Enamelware 1.7 Qt. Melamine Bowl - 8 1/4" x 3 3/4"
Perfect for high-volume operations, the Champion E series rack conveyor dish machines ensure that dishes are washed consistently, completely, and with minimal water consumption. This premier series is available in a variety of configurations so that you can select the one that best meets your needs. 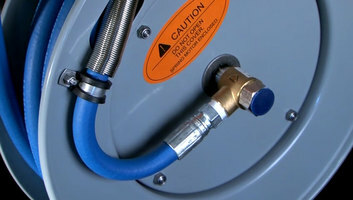 Make clean-up a breeze in your facility with a T&S hose reel! Easy to install and easy to use, each hose reel is built for superior reliability, delivering the most convenient product possible to suit your needs. Ever wonder why your ice maker seems to continuously produce ice, yet never overflows? Watch this video from Hoshizaki to learn about a smart sensor inside the machine that keeps constant tabs on ice production.